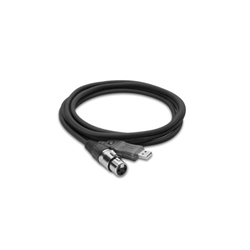 The Hosa Technology UXA-110 Tracklink Microphone XLR Female to USB Interface Cable is a 10-foot XLR to USB cable for converting analog microphone audio to digital PCM data for editing within a Mac or Windows Digital Audio Workstation. Simply plug the XLR end of the cable into a dynamic microphone and the USB end into the computer, and the cable will function as an audio interface. A built-in light will illuminate to indicate a secure connection and the recording status. No drivers are required for the interface cable.